PORTLAND, Maine (AP) — Democrats champing at the bit to unseat Republican Sen. Susan Collins are organizing, raising money and going on the attack. All they need is a strong candidate. Behind the scenes, the Democratic Senatorial Campaign Committee is fundraising, and a Democratic group is launching television attacks on Collins over the partial government shutdown. There’s also a crowdsourced nest egg awaiting her challenger. But so far, no high-profile Democrat has announced a challenge to Collins next year, even though the expectation is that a serious candidate will emerge soon. Critics are still incensed over Collins’ vote for U.S. Supreme Court nominee Brett Kavanaugh , for which protesters rallied at her office and a letter that mentioned ricin was sent to her home. They’re angry over the government shutdown, among other things. They say she has veered to the right and are no longer confident she will stand up to President Donald Trump. Collins, a self-described centrist in an era of increasingly polarized politics, is the last Republican member of Congress from New England. Nationally, the ranks of moderates have thinned with the retirements of Sens. Jeff Flake, of Arizona, and Bob Corker, of Tennessee. Her position makes her vulnerable from attacks on both sides. She has angered Democrats, as well as those within her own party. “Is there a big bull’s-eye on her seat? You’re darned right there is,” said William Mayer, a political science professor at Northeastern University. 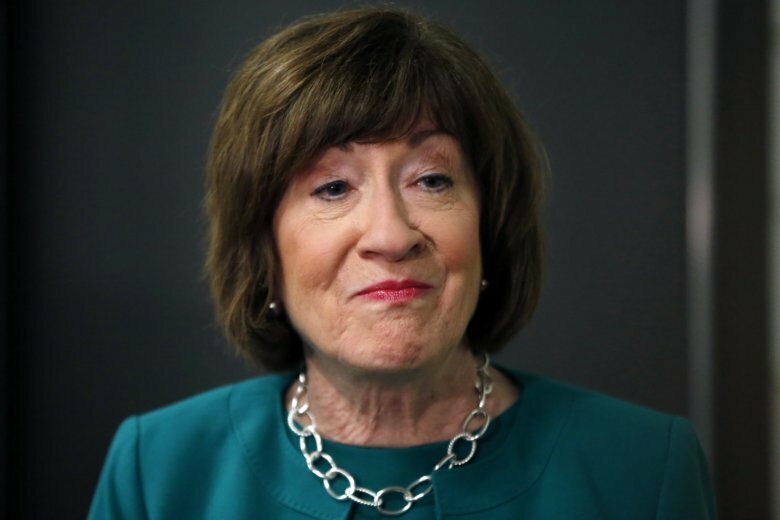 The race is still early, and Collins herself hasn’t formally announced she’ll seek re-election. But her staff is laying the ground work for a campaign, and she remains a formidable incumbent. She was first elected to the Senate in 1996, and she won her last two elections with more than 60 percent of the vote. “No matter who her opponent may be, two things are certain: Nobody will outwork her, and nobody will have her extraordinary command of federal issues,” said spokeswoman Annie Clark. Susan Rice was the first candidate to express interest, in October. The national security adviser under Democratic former President Barack Obama said Collins’ support of Kavanaugh “betrayed women across this country” and prompted her to contemplate a bid to unseat her. Rice, who visited Maine in the summers when she was a girl and owns property in the state, said previously that she’d make her announcement after the midterm elections. So far, she hasn’t elaborated on her intentions, and her office said she had no comment. Other Democrats thinking about the race are Maine’s 1st District U.S. Rep. Chellie Pingree; her daughter, Hannah Pingree; businesswoman Rosa Scarcelli; Daniel Kleban, co-owner of Maine Beer Co.; and Emily Cain, executive director of Emily’s List. Whoever runs will have plenty of financial backing. The Democratic Senatorial Campaign Committee is already raising money, and the crowdsourced fundraising by Maine People’s Alliance, Mainers for Accountable Leadership and activist Ady Barkan has raised more than $3.5 million. For now, the only person to declare candidacy is independent Danielle VanHelsing, who hopes to become the first transgender member of Congress. The only Democratic challenger, Dr. Cathleen London, of Milbridge, has suspended her campaign. At this point, there are many variables at play in the race. Among them, the Democratic electorate is energized, and that energy shows no sign of waning. The economy and Trump’s presidency are wild cards. So is the political fight over a wall at the Mexican border. “The Trump people aren’t happy with her. Democrats aren’t happy with her. At times like this, the center may not hold,” he said. This story has been corrected to show that a former candidate’s name is Cathleen London, not Cathy London.